NASA's venerable Voyager 1 probe has encountered a strange new region at the outer reaches of the solar system, suggesting the spacecraft is poised to pop free into interstellar space, scientists say. Voyager 1, which has been zooming through space for more than 35 years, observed a dramatic drop in solar particles and a simultaneous big jump in high-energy galactic cosmic rays last August, the scientists announced in three new studies published today (June 27) in the journal Science. "I think it's probably several more years — 2015 is reasonable," said Voyager project scientist Ed Stone of the California Institute of Technology in Pasadena, lead author of one of the new studies and co-author of another. "But it's speculation, because none of the models we have, have this particular region in them," Stone told SPACE.com. "So none of the models can be directly and accurately compared to what we're observing. What we're observing is really quite new." Voyager 1 and its twin, Voyager 2, launched a few weeks apart in 1977 to study Saturn, Jupiter, Uranus and Neptune. The probes completed this unprecedented "grand tour" and then kept right on flying toward interstellar space. Voyager 1 should get there first. At 11.5 billion miles (18.5 billion kilometers) from Earth, the spacecraft is the farthest man-made object in space. Voyager 2, for its part, is now 9.4 billion miles (15.1 billion km) from home. Both probes are currently plying the outer layers of the heliosphere, the enormous bubble of charged particles and magnetic fields surrounding the sun. But things are really getting interesting for Voyager 1, the new studies report. On Aug. 25, 2012, the probe recorded a 1,000-fold drop in the number of charged solar particles while also measuring a 9 percent increase in fast-moving particles of galactic origin called cosmic rays. Those are two of the three phenomena that Voyager scientists expect to see when the spacecraft crosses over into interstellar space. But Voyager 1 still hasn't observed the third one — a shift in magnetic-field orientation, from east-west within the solar system to roughly north-south outside of it. The magnetic field "did not change direction. All it did was get compressed, so it's stronger now than it was," Stone said. "That's what one would expect if, in fact, the energetic particles, which were providing the pressure, suddenly left." 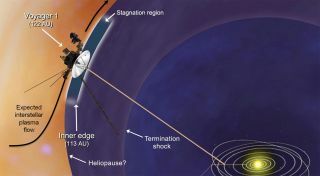 Overall, researchers said, Voyager 1's new data suggest that the spacecraft remains within the solar system, though it appears to be in a sort of interface region connecting the heliosphere and interstellar space. Mission scientists will keep an eye on the magnetic-field readings over the coming months and years, Stone said. "If there's a dramatic change, like there was last Aug. 25, that will be very exciting," he said. "If it's a gradual change, well, it'll just take us longer to realize what's happening." Stone and his colleagues hope that Voyager 1 leaves the solar system before 2020. The probe's declining power supply will force engineers to shut off the first instrument that year, and all of them will probably stop working by 2025. There's no reason to think anything will go wrong before 2020, since the spacecraft remains in good health despite its advanced age. But the mission team knows there are no guarantees. "Something could break. That's what you can't predict — the random failure," Stone said. "So far, we've been lucky. There haven't been any catastrophic random failures."